An off-set altercation has imperiled car show "Top Gear" one of the BBC's most lucrative productions. BBC News said Wednesday that the broadcaster has postponed the three remaining episodes after suspending host Jeremy Clarkson over a reported "fracas" with a producer. The BBC hasn't given details of the incident, but co-host James May characterized it as "a bit of a dustup." "But I don't think it's that serious," he added. The blend of car news, humor and blokey banter in "Top Gear" has won it legions of fans. The current series was launched simultaneously in more than 50 countries and the BBC has sold the format for locally produced versions in the U.S., China, Russia, Australia and South Korea. It has also attracted controversy, much of it attached to 54-year-old Clarkson, the best-known of the three main presenters and a self-styled enemy of "political correctness." In October, the "Top Gear" crew was forced to flee Argentina after facing violent protests for allegedly referencing the 1982 Falkland Islands war on a license plate. 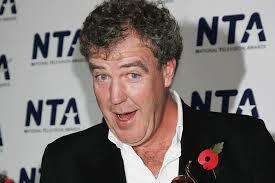 Last year, Clarkson asked for forgiveness after allegedly using the racist n-word during filming for the show. He said at the time had been given a "final warning" by producers. In 2011, the BBC apologized to Mexico after Clarkson and his co-hosts characterized Mexicans as lazy and oafish. Fans clamored Wednesday for Clarkson's return. The government's culture minister, Maria Miller, called the TV personality a "legend," and said the BBC "needs to be better at managing its talent." "There are other organizations that have to deal with larger-than-life characters," she said. Will Wyatt, a former director of BBC television, said the broadcaster could try to continue "Top Gear" without Clarkson, but "it would be a bit like the Musketeers without D'Artagnan." "He is certainly the major personality in it and a huge part of its appeal," Wyatt said. Clarkson appeared to be taking a relaxed attitude, even as reporters and photographers camped outside his London home. Emerging, he announced he was "just off to the job center."